I made a post earlier with all my favorite ideas for classroom valentines, then I let my kids choose their favorite. My oldest chose the "scrabble valentines." However, she couldn't be easy and want to use their free printable, no sirree. She wanted to do it herself. So we did. She and I had a lot of fun though! It was a good mother-daughter moment. 1) First, we cut out a lot of squares. 2) Then we cut out a lot of BIG squares and folded envelopes for everyone. 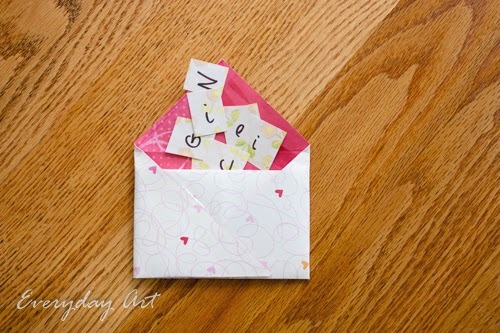 We followed this great tutorial for folding envelopes over at Nellie Bellie. 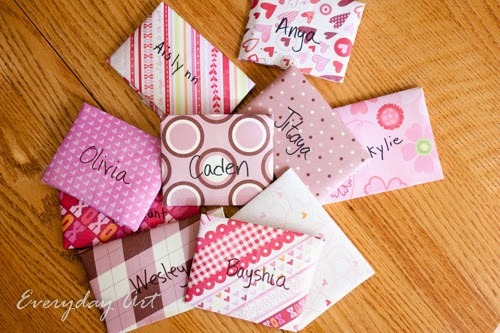 3) Then, She thought of a sweet, short message for each classmate ("nice girl," "good speller," "fast guy," "math wiz," etc.) 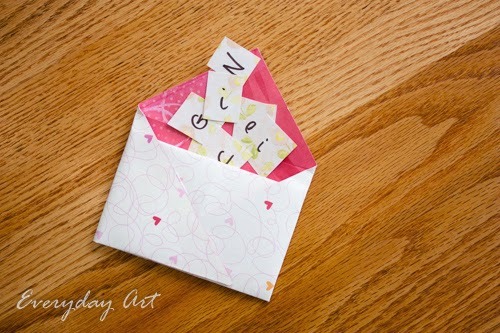 and we wrote them on the little squares, stuffed them in the envelopes and sealed addressed them. One girl down and on to the next!